The property is situated in the heart of Tadcaster in the historic area of Kirkgate close to the Church and The Ark. Tadcaster is a thriving market town situated on the River Wharfe and close to the A64 trunk road with easy access to both Leeds and York. The town is well served with shops including a Sainsburys supermarket and numerous other smaller shops selling a wide range of goods. There is good schooling available at both primary and senior levels including the very popular and sought after Tadcaster Grammar School. There are a wide range of public houses in the town as well as restaurants and takeaways. The Church is a focal point of the town. The town is dominated by the three Breweries who provide a huge amount of employment prospects along with many small businesses throughout the town. We are pleased to offer this superb investment property which is currently fully let. The units comprises a lock up shop with store and staff areas totalling approximately 560 sq ft. The shop which is "The Chocolate Box" is a newsagents/tobacconists/confectionary shop comprises approx. 367 sq ft and 190 sq ft of store and staff area. 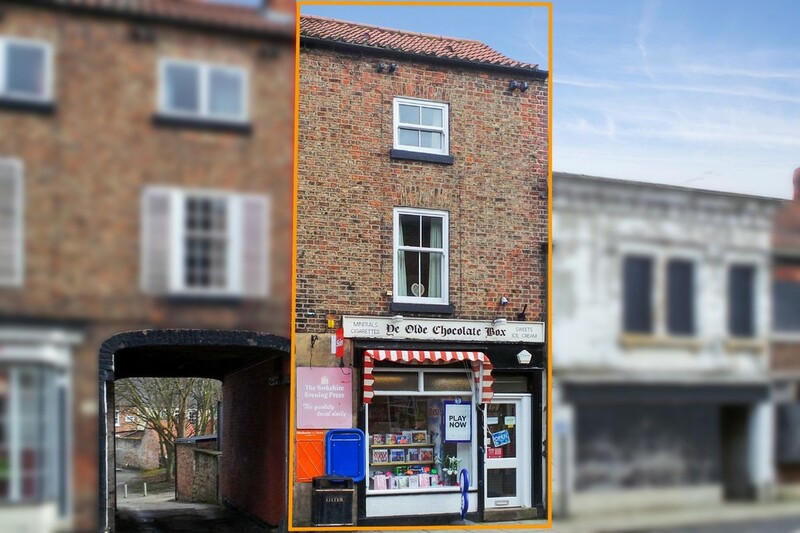 The shop has been let since 1984 to the same tenants and currently the rent is £480 pcm. They have indicated they wish to stay. The duplex flat on the first and second floors over the shop comprises an entrance hall, lounge, kitchen/dining room and Two bedrooms and bathroom to the second floor. The flat is heated by electric night storage heating.The current rent is £540 pcm and is let on a Assured Shorthold Tenancy agreement. The garage is located to the rear of the unit and is currently let to a local business at a rent of £30 pcm. Store and Staff area 22'3" x 8'6"
Kitchen/Dining Room 12'3" x 9'9"
Bedroom 1 14'6" x 11'10"
Bedroom 2 9'9" x 7'9"
Viewing is strictly by appointment only. Appointments must be made and no "on spec" visits should be made to the shop.